So the sudden trip to Bruce Pearl’s Tennessee program over the past week was more than just a last minute stop. 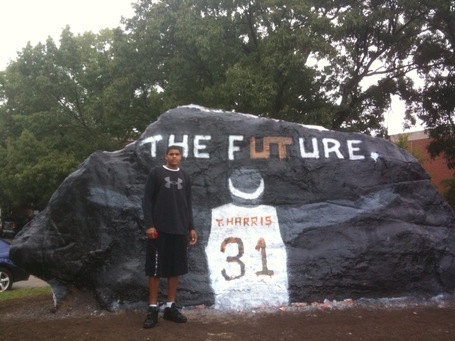 Today Tobias Harris (PF, 6’8″, 2010) committed to Pearl and the Volunteers, giving Bruce a serious big man in the class. NC State has not been shy about picking up early commitments in the past, and now they’ve landed Joseph Uchebo (C, 6’9″, 2012), a player originally from Nigeria and currently playing in North Carolina at Oak Ridge Military Academy. I don’t have much info on Uchebo, so I will have to drop by Oak Ridge and get some video, but he seems like a big post player that Lowe is probably looking to develop. Tobias Harris (PF, 6’8″, 2010) just finished an expected visit to Georgia Tech, and then followed up that visit with an unexpected visit to Tennessee. Bruce Pearl and Tennessee are proving that they are becoming one of the top programs in the country, and Harris’s upcoming announcement is still up in the air. NC State is still high on the list for C.J. Leslie (SF, 6’8″, 2010), who is also highly considering Maryland, Florida, Kentucky, UConn, Georgetown and Tennessee. Oregon has also been mentioned. Although Leslie plays his high school ball in NC State’s back yard, he’s not on an imminent timetable like Harris at this point. Saying ‘high on the list’ is possibly a misnomer, since Leslie has maintained no favorites at this time. As for Leslie’s skills and game, I will have more in the near future, but from my perspective, he’s much more of a 3 than a 4, he can shoot from outside and plays facing the basket. While a couple ACC teams continue to wait on top big man Tobias Harris (PF, 6’8″, 2010) to announce, Maryland has landed Ashton Pankey (PF, 6’8″, 2010) out of St. Anthony High School in New Jersey. Maryland’s recruiting woes over the past couple of years might be clearing up, especially at the post. Maryland had reportedly also been recruiting Roscoe Smith (SF, 6’7″, 2010), but he is reportedly no longer considering the Terps. With the Harrison Barnes (SF, 6’7″, 2010) recruiting saga over and UNC the victor, ACC recruiting turns to the next big 2010 recruit that might play ball in the ACC and hasn’t committed. That would be Tobias Harris (PF, 6’8″, 2010), who is considering Maryland, Georgia Tech, Kentucky and West Virginia along with some other schools. Barnes just completed a campus visit to Maryland, and he’ll visit Georgia Tech next. ACC fans won’t have to wait long to find out where Harris is going, he’s scheduled to announce on November 19th, although it likely won’t have the fanfare of Barnes. Harris is a true post player who works hard in the paint, and would be able to get minutes in either the Big East or ACC. And Harrison Barnes, the all-world Iowa standout has picked UNC and will play for Roy Williams and the Tar Heels. A massive pick up for an already loaded UNC team. The have landed a top offensive player, with a lot of maturity and poise. Gotta love his ability to put the ball on the floor and take a defender off the dribble. He’ll be fun to watch at the collegiate level. So the question of the day, at least until 4pm, is ‘Where is Harrison Barnes going to go?’. I’ll post that when he announces, but I wanted to post some thoughts on Barnes’ game, the skills which he will take wherever he ends up. Barnes is built like a SF, but he’s got serious ballhandling ability, is extremely fluid and poised with the ball and can play defense. He’s definitely got the skills to become an NBA 2 guard.I hesitate to say that he would ever play PG in the pros, because moving him there would limit his offensive options and I really don’t know if he’s the type of player to direct an offense. In my mind, he’s an offensive catalyst and unlike a lot of NBA and college ‘big’ guards who carry the ball and push off in order to play the position, Barnes actually can handle the ball, can slash to the hoop and can shoot from outside. I’ve seen knocks on Barnes ability to create his own shot, but honestly I haven’t seen that as an issue. If anything, I’d like to see how well he can shoot from outside when he’s guarded by better defenders at the collegiate level; his release seems fluid but a tad slow, but that might just be because he makes it look so easy. Time will tell. All in all, he’s got a great game. You are currently browsing the ACC Basketball Recruiting blog archives for November, 2009.